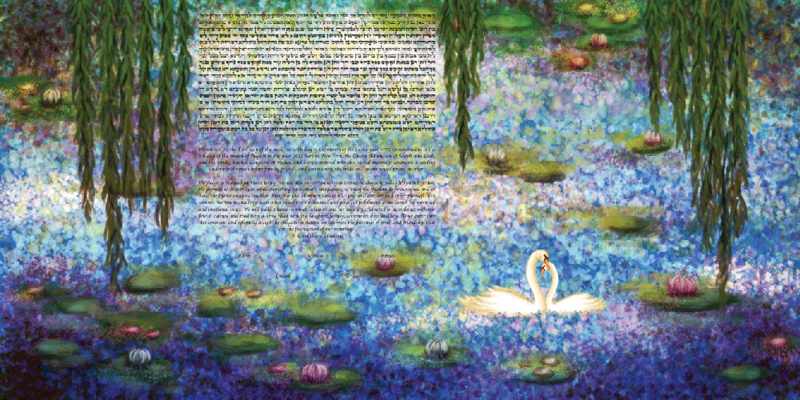 Sit back and relax while you and your partner are swept up by the tranquility and beauty of our Quiet Lilies Ketubah. The alluring blend of blues, greens and light purple creates the classic scene of a picturesque afternoon at the park. Influenced, of course, by Monet’s Water Lilies, this Ketubah inspires nothing but the utmost sentiment of love, commitment and unity. This Ketubah is a reflection of the couple that enjoys the calm serenity of nature and basking in the warmth of one another’s love, like swans, calmly floating along life’s path. As you both go through various seasons of your life together, let Quiet Lilies take you back to that peaceful and simple place.